The Purple Sugalite & Sterling Silver Bracelet ($1,175) is one pricey serpant. 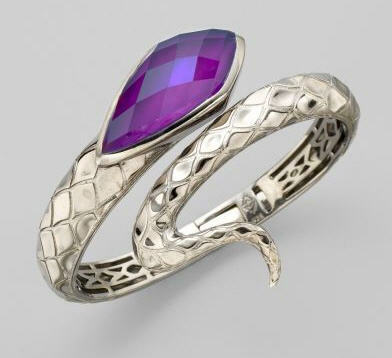 From the Queen Cobra Collection, a sensuous snake with textured “scales” of sterling silver and a faceted head of purple sugalite coils its way alluringly around the wrist. This bracelet has an elegant, but dangerous vibe to it.